As you know, most of OAFE's reviews of female figures don't come from me; but since Artemis's collection focuses more on the "insanely hot" than just "anything with breasts," I think I'll be safe to cover this one. Once she was the talk of the town - a high-profile socialite whose wit was her weapon among Rapture's elite. As the city fell from grace, so did she - becoming addicted to ADAM, splicing herself stronger and faster to feel safe in the streets. She resents having to eat refuse and scrabble for ADAM, but ultimately, she's a survivor. As a "Leadhead," she pelts her enemies with bursts of tommy-gun fire between vicious verbal barbs. 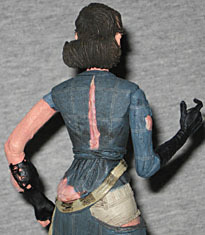 The Ladysmith Splicer appeared in the original BioShock, but this figure is based on BioShock 2. How can you tell? 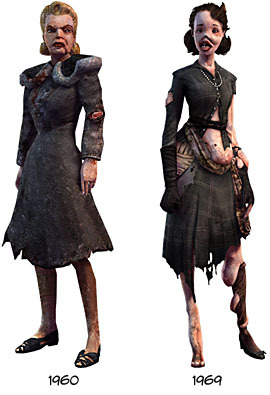 Because back in the day ("the day" being 1960, the setting of the original game), the Splicers were ugly and over-modified, but still looked basically human. Just think of those women who've had too much plastic surgery, and you'll have the idea. After another decade under the water, things have gotten worse. Ladysmith is still wearing a '50-style house dress, but she's lost the housecoat and mink shrug. She's also lost one of her shoes, but that's because her foot has deformed to such a huge extent - it's like a freaky little hoof. A tear over the right hip reveals her underwear: giant drawers and the lower edge of a corset. I don't know where the corset disappears to, because there's a slit over her spine where it should be visible, but isn't, and her warty, veiny gut is spilling out the left side. Her right arms is mostly normal, but the left has a large tumor growing in the middle of the forearm, shredding her glove in the process. Her left leg would look more normal than her right, if it didn't have a tumorous lump, a tentacle warpping around her shin, and a thumb growing out of her inner thigh. Delightful! Her face has gotten worse over the years, too. Although, admittedly, she does look younger, so obviously the plastic surgery is working for her. Sure, it's cost her her nose (now a smooth flap across the middle of her face) and half her teeth, but isn't that worth it? She's also gone from blonde to brunette, but that could just be a result of Rapture running out of hair dye. Always the essentials, huh? Articulation isn't quite as high as it could be, but it's adequate. Her elbows are swivels, but without equivalent wrists, her hands will be upside down if you use them. Her shoulders are swivel/hinges, so you can still get decent poses out of the arms. Her neck is a balljoint, and more surprisingly, so is her waist! It's hidden behind the sash. Her left leg has a swivel at the underwear line, and another at the top of her stocking, but those are just for balance. You'll really need to check the paint on the Ladysmith Splicer, because there were a lot of paint errors on the samples that showed up at my Toys Я Us; well, maybe not "errors," but definitely a lot of variation from one figure to the next. 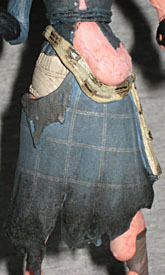 The paint on her face, the details (or lack thereof) on her stomach, and even the shadows and highlights on her dress varied from figure to figure. It's not that any of them were fundamentally wrong, but they were definitely different, and you'll have to choose from all the ones available to get the one you like best. Due to her weird feet, Ladysmith Black Mambazo Splicer comes with an oval display base. It's not detailed at all, it just keeps her standing - too bad Jonah Hex's Lilah can't say the same thing, eh? Her accessories include a very impressive Tommy gun (not, sadly, the pistol she's named for [you didn't think she was just a "lady" named "Smith," did you? ]), and a rolling pin. Finally, she has the rabbit mask she wore to the 1959 New Year's Masquerade Ball - it's seen better days, being cracked, broken, and riddled with bullet holes. It's very nicely detailed, both front and back, and the paint apps make it look old and dirty. There's no strap to hold it on, no peg holes in her head to keep it in place. Instead, NECA designed it to stay on her face of its own power: there's a small hook hidden behind the broken left ear, and it's designed to fit into a completely innocuous curl of her hair. Brilliant! The mask stays on securely, and looks natural when it's in place. NECA's Ladysmith Splicer is a hideous monster of a woman. She's painful to look at, and unsettling to consider. But that is as it should be: that's how she looks in the game, as well. There are some paint problems, to be sure, but it's still easy to find one that looks good. Well, as good as she's supposed to look, anyway. The accessories are great, and face it, you need someone to fight all your Big Daddies.